There is a huge need for foreigners fluent in English and qualified to teach that language, says Dr. Matthew John Kay of Chiang Mai University’s new language institute. Schools are having trouble filling positions. There are more jobs than qualified teachers. To help meet demand, in November the CMU institute will launch a certificate program to qualify more foreign teachers for the local market. 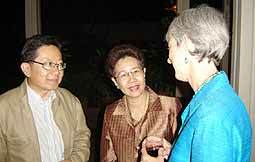 TEFL manager Dr. Matthew John Kay and Language Institute director Sansanee Wannangkoon. 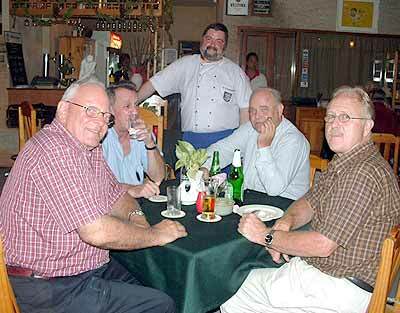 According to Kay, the Chiang Mai economy is growing in ways that simply require English. We live in an expanding tourist center. There are many foreign-owned industrial plants here, with foreign managers. And our export business is critical, whether in widgets or village crafts. To compete with our Southeast Asian neighbours, we have to develop better local skills in the English language. It’s that simple. CMU created its language institute nearly two years ago to help meet that seemingly insatiable demand for better language skills. Today, the institute offers a dozen English courses for Thai students. It also offers programs aimed at English-speaking foreigners. The first course into the classroom was Survival Thai for Foreigners – a 50-hour course for beginners priced rather attractively at 90 baht per hour. But the big enchilada of the institute’s new offerings for farang is its Teaching English as a Foreign Language (TEFL) certificate program. 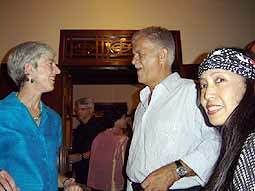 The course is aimed primarily at foreigners who want to teach English in Thailand. Taught to a university standard, the program requires fluency in English and spotlights common teaching issues encountered in this country. It does not, however, require a university degree. This means enrolees should check their personal qualifications against Thailand’s work permit requirements before signing up! According to language institute director Sansanee Wannangkoon, the course will be gruelling. Says she, You have to think of anything that involves 120 hours of structured learning and training over a four-week period as a short-term, full-time job. Offered each month, the course will include 60 hours of class work on teaching theory and practice. Another 60 hours will go toward practicum – observing an English class for Thai students, preparing class plans and helping conduct the class. And then there is the homework: besides studying their course books, students will write reports and take a final exam. Gruelling is the word. At 45,000 baht, the course is slightly less expensive than the other certificate program in Chiang Mai. It gets better, chimes in TEFL Manager Matthew John Jay, whose irrepressible enthusiasm makes the program sound like the best thing since tom yum gung. The course fees include all teaching materials and a catered coffee break. Real coffee!! For Thai educators, the issue of English skills in Thailand still rankles. A few months ago, the media covered in gruesome detail the state of English in this country. An authoritative study of the countries of Southeast Asia had found Thailand near the bottom of the heap – ahead of Cambodia and Laos only. As a result, the Taksin government upped the ante in the language sweepstakes. To increase English skills throughout the country, the government laid out a number of initiatives. For example, it proposed new incentives for teachers who are Thai nationals to improve their English. In addition, the government is encouraging secondary (mathaym) schools to hire qualified native-speaker teachers. Says Jay, English teacher salaries at government schools in the Chiang Mai area can start at 25,000 baht per month. Private language schools sometimes offer more, but they don’t often offer fulltime jobs. 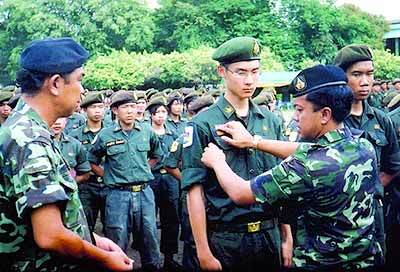 American Pacific International School (APIS) students who have completed the equivalent of ninth grade in Thai schools have for a number of years now been taking part in military training in Chiang Mai. They have been supported in this by Thanyaluck Srinuankieaw (Khun Aey), who is more commonly seen answering the telephone in APIS reception area on the Main Boarding Campus, and Thipanan Jinda (Ajan Por), physical education teacher. 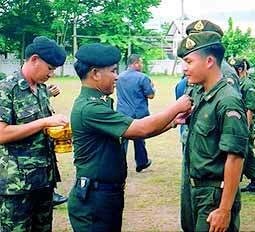 During the summer break in July, four APIS students joined other young people at the military training camp held at Jomthong School. They were Pitipat Sirikietsang (Pan), Komsoon Suesatsanit (Pong), Anantron Vinijtaopatham (Tape) and Bhuviang na Chiangmai (Jink). All four young men passed their training and we were particularly proud that Komsoon was one of the trainees who scored a perfect 45 in the shooting test, with Pan being in the second group, scoring 41. Germany marked its 15th anniversary of reunification on Monday. But as much political uncertainty is heard on the political sector, there is one thing that reunites all Germans, the love of food. 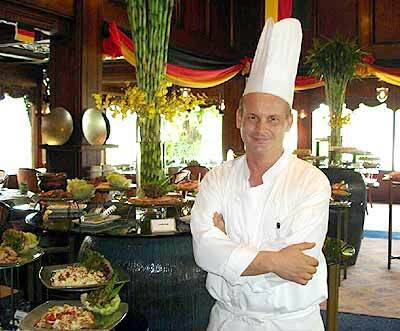 New and old Chef Stefan Frenzel returned to Amari Rincome last month and surprised the regulars with a true German feast at the lunch buffet.. In various restaurants around Chiang Mai, restaurateurs put the best on the table of what German cuisine has to offer and knowing from experience, the variety is almost endless. While North and South Germany are culinary as far apart as politically and while the politicians are still trying to find solutions and searching for directions, the Chefs of Chiang Mai simply combine their efforts. German National Day lunch at the air-conditioned environment of La Gritta in the Amari Rincome Hotel was a hit and the new or can we say “old” chef Stefan Frenzel had prepared a trip from Hamburg to Baden Baden, and from Munich to Berlin. Specialties from all these regions were presented and Chef Stefan was on hand to point out the various delicacies. Dining in the evening at the German restaurant To Nobody however was more regional, but a true reunification buffet, with equal standards on Bavarian and East German fusion at its best. Taste buds and stomachs of everybody who joined were extended and nothing seemed to be stereotypical but tasteful and homemade. Guests were seen long after the normal hours, just sitting and digesting with a digestive. And where else can you get that if not in a real German restaurant. Hopefully the politicians can overcome their problems as much as the Chefs in Chiang Mai seem to reunite anybody, no matter which party, nationality, or gender. Love for food is their keyword. As the flood waters ebbed last Friday night, U.S. Consul General Bea Camp hosted a welcome reception for Consulate newcomers Ray Murphy, and John and Jami Spykerman. 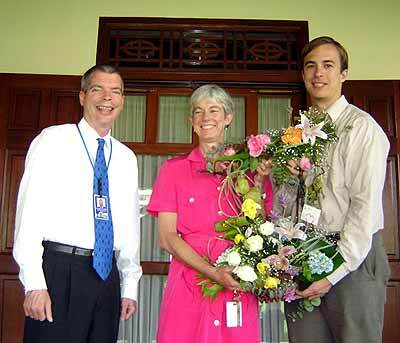 New Management Officer Ray Murphy found himself feted by some 60 guests barely two hours after landing in Chiang Mai; Vice Consul John Spykerman and his wife arrived in August from a previous assignment in Washington, D.C.
CG Bea Camp was there to greet everybody personally who was brave enough to do the trip to the consulate. See here with Preecha and Waranan Pongcharoenkul, owners of Fondue House and Museum of Jade. Invited guests called the Consulate throughout the day, rather incredulous that the welcome reception plan was going forward. A “dock” was created just outside the riverside gate to facilitate the guests’ arrival, and a pick-up service from a parking area a block away to the dock was put into effect. German Hon. Consul Hagen Dirksen and his wife Wanphen seemed relieved that they ‘made it’ despite the floods.